The simplifications which result from the single-crystal condition materially assist in describing the deformation behavior in terms of crystallography and defect structure. However, with the exception of solid-state electronic devices, single crystals are rarely used for engineering applications because of limitations involving their strength, size, and production. Commercial metal products invariably are made up of a tremendous number of individual crystals or grains. The individual grains of the polycrystalline aggregate do not deform in accordance with the relatively simple laws which describe plastic deformation in single crystals because of the restraining effect of the surrounding grains. The purity and method of preparation determine the initial dislocation density and substructure. These limited variables introduce enough complexity that mechanical behavior cannot in general be predicted with high precision as a function of strain, strain rate, temperature, and stress rate. However, the introduction of still greater complexity is needed to produce materials of highest strength and usefulness. Thus, fine grain size is often desired for high strength, large additions of solute atoms are added to increase strength and bring about new phase relationships, fine particles may be added to increase strength and phase transformations may be utilized to increase strength. These various strengthening mechanisms and other aspects of the deformation of polycrystalline materials are considered in this paper. The boundaries between grains in a polycrystalline aggregate are a region of disturbed lattice only a few atomic diameters wide. In the general case, the crystallographic orientation changes abruptly in passing from one grain to the next across the grain boundary. The ordinary high-angle grain boundary represents a region of random misfit between the adjoining crystal lattices. As the difference in orientation between the grains on each side of the boundary decreases, the state of order in the boundary increases. For the limiting case of a low-angle boundary where the orientation difference across the boundary may be less than 1°, the boundary is composed of a regular array of dislocations. Direct evidence for the mechanical strengthening of grain boundaries is provided by experiments on bicrystals in which the orientation difference between longitudinal grain boundaries was varied in a systematic manner. The yield stress of the bicrystals increased linearly with increasing misorientation across the grain boundary, and extrapolation to zero misorientation angle gave a value close to that of the yield stress of a single crystal. These results imply that a simple grain boundary has little inherent strength and that the strengthening due to grain boundaries results from mutual interference to slip within the grains. A definite substructure can exist within the grains surrounded by high-energy grain boundaries. The subgrains are low-angle boundaries in which the difference in orientation across the boundary may be only a few minutes of arc or, at most, a few degrees. Because of this small orientation difference, special x-ray techniques are required to detect the existence of a substructure network. Strain aging is a type of behavior, usually associated with the yield-point phenomenon, in which the strength of a metal is increased and the ductility is decreased on heating at a relatively low temperature after cold-working. The introduction of solute atoms into solid solution in the solvent-atom lattice invariably produces an alloy which is stronger than the pure metal. There are two types of solid solutions. If the solute and solvent atoms are roughly similar in size, the solute atoms will occupy lattice points in the crystal lattice of the solvent atoms. This is called substitutional solid solution. Solute atoms fall into two broad categories with respect to their relative strengthening effect. Those atoms which produce non-spherical distortions, such as most interstitial atoms, have a relative strengthening effect per unit concentration of about three times their shear modulus, while solute atoms which produce spherical distortion, such as substitution atoms, have a relative strengthening of about G/10. Of these various mechanisms, the elastic interaction, modulus interaction, and long-range order interaction are long range, i.e., they are relatively insensitive to temperature and continue to act to about 0.6Tm. The other three interactions constitute short-range barriers and only contribute strongly to the flow stress at lower temperatures. 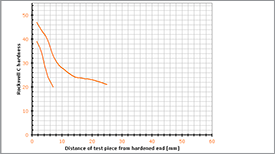 Small second-phase particles distributed in a ductile matrix are a common source of alloy strengthening. In dispersion hardening the hard particles are mixed with matrix powder and consolidated and processed by powder metallurgy techniques. However, very many alloy systems can be strengthened by precipitation reactions in the solid state. Precipitation hardening, or age hardening, is produced by solution treating and quenching an alloy in which a second phase is in solid solution at the elevated temperature but precipitates upon quenching and aging at a lower temperature. For precipitation hardening to occur, the second phase must be soluble at an elevated temperature but must exhibit decreasing solubility with decreasing temperature. By contrast, the second phase in dispersion-hardening systems has very little solubility in the matrix, even at elevated temperatures. Usually there is atomic matching, or coherency, between the lattices of the precipitate and the matrix, while in dispersion-hardened systems there generally is no coherency between the second-phase particles and the matrix. The requirement of a decreasing solubility with temperature places a limitation on the number of useful precipitation-hardening alloy systems. On the other hand, it is at least theoretically possible to produce an almost infinite number of dispersion-hardened systems by mixing finely divided metallic powders and second-phase particles (oxides, carbides, nitrides, borides, etc.) and consolidating them by powder metallurgy techniques. Advantage has been taken of this method to produce dispersion-hardened systems which are thermally stable at very high temperatures. Because of the finely dispersed second-phase particles, these alloys are much more resistant to recrystallization and grain growth than single-phase alloys. Because there is very little solubility of the second-phase constituent in the matrix, the particles resist growth or overaging to a much greater extent than the second-phase particles in a precipitation-hardening system. The general requirement for precipitation strengthening of supersaturated solid solutions involves the formation of finely dispersed precipitates during aging heat treatments (which may include either natural aging or artificial aging). The aging must be accomplished not only below the equilibrium solvus temperature, but below a metastable miscibility gap called the Guinier-Preston (GP) zone solvus line. The supersaturation of vacancies allows diffusion, and thus zone formation, to occur much faster than expected from equilibrium diffusion coefficients. In the precipitation process, the saturated solid solution first develops solute clusters, which then become involved in the formation of transitional precipitates. The mechanism of strengthening from precipitation involves the formation of coherent clusters of solute atoms (that is the solute atoms have collected into a cluster but still have the same crystal structure as the solvent phase). This causes a great deal of strain because of mismatch in size between the solvent and solute atoms. Consequently, the presence of the precipitate particles, and even more importantly the strain fields in the matrix surrounding the coherent particles, provide higher strength by obstructing and retarding the movement of dislocations. The characteristic that determines whether a precipitate phase is coherent or no coherent is the closeness of match or degree of disregistry between atomic spacing on the lattice of the matrix and on that of the precipitate. These changes in properties result from the formation of solute-rich microstructural domains, or GP zones. The GP zones are of the size range of tens of angstroms in diameter. They are essentially distorted regions of the matrix lattice, rather than discrete particles of a new phase having a different lattice. As such, they are completely coherent with the matrix, imposing local but often large strains on it. These mechanical strains, as well as the presence of a locally solute-rich, sometimes ordered lattice, can account for large changes in mechanical properties of the alloy before any long-range microstructural changes occur. The GP zones are characteristically metastable and thus dissolve in the presence more stable precipitate. This dissolution causes a precipitate-free, visibly denuded region to form around the stable precipitate particles. The final structure consist of equilibrium precipitates, which do not contribute as significantly to hardening. where f is the volume fraction of the dispersed phase and ε is the measure of the strain field. For this mechanism to operate the particle must have a structure which gives rise to extended dislocations. Strengthening due to ordered particles is responsible for the good high-temperature strength of many superalloys. If the particles have an ordered structure then anti-phase boundaries are introduced when they are sheared. The model of strengthening from ordered particles depends on the details of the size and spacing of the particles.